Two years ago Alfa-Laval, Inc. of Fort Lee, N.J. sponsored a sym- posium on modern fuel systems. Laval and Diesel Progress. It brought together engine builders, oil companies, shipyards, vessel owners and manufacturers of fuel- treatment additives. The program was oriented to the needs of inland and coastal water- ways operators. The topics covered included basic fuel chemistry, fuel purification, additives, fuel blend- ing, heavy-fuel burning, engine design and operating experience. Fuels in 1983." He stated that his definition of quality is "if the prod- uct does the job it was intended to do, that's quality. It may not smell good or look good—the laboratory analysis may indicate major defi- ciencies, but if it passes the per- formance test in the engine, it is a quality product." He went on to state: purchasing blended marine fuels has an ele- ment of art to it. First of all, in- sisting on the lowest possible price at all times assures you of one thing—if there is a problem fuel in the market place, you will get your share of the headaches. Another simple rule is to avoid confusing a fuel-supply specifica- tion with an engine specification. The fuel coming over the rail, in most instances, is not the fuel in- jected into the combustion cham- ber. One is a treated fuel, the other is not. I realize this is basic stuff, but it amazes me how often sophisticated operators buy an ex- pensive grade of blended fuel be- cause, I suspect, they either don't know or don't trust their onboard treatment procedures. In summary, the current high- speed diesel operator contemplat- ing installation of medium-speed residual-burning diesel engines will have to make some judgement calls on blended-fuel quality and availability. Unlike No. 2 diesel, the specifications for blended fuels are vague and there is a lot of in- formation missing. Progress on testing and the exchange of infor- mation is improving, but we still have a way to go. Alternately, there are operators worldwide successfully using this type of equipment despite the aforementioned shortcomings. 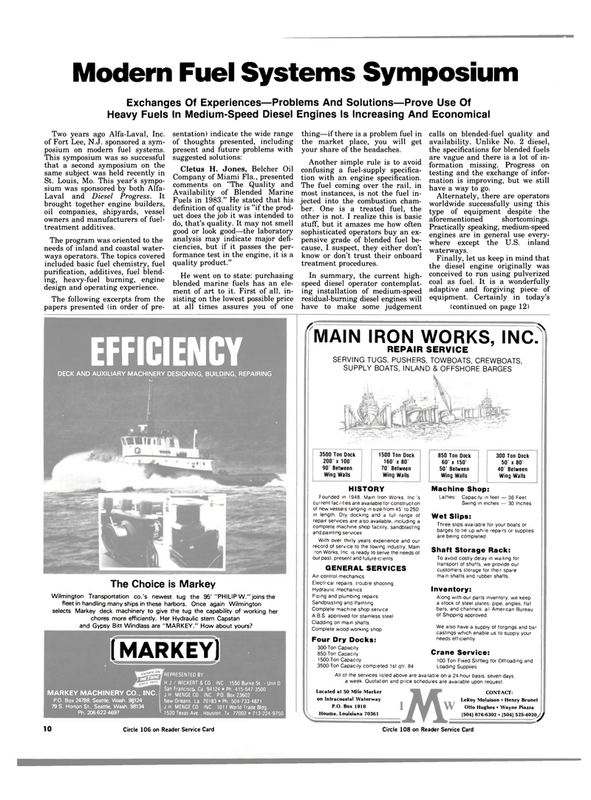 Practically speaking, medium-speed engines are in general use every- where except the U.S. inland waterways. With over thirty years experience and our record of service to the towing industry, Main ron Works, Inc. is ready to serve the needs of our past, present and future clients. To avoid costly delay in waiting for transport of shafts, we provide our customers storage for their spare main shafts and rubber shafts. Along with our parts inventory, we keep a stock of steel plates, pipe, angles, flat bars, and channels, all American Bureau of Shipping approved. All ot the services listed above are available on a 24-hour basis, seven days a week. Quotation and puce schedules are available upon request.